Debra mixes the traditional designs with bright and feminine colours such as orange, purple and pink and as you view the artworks you get a sense of the important stories which are shared through the artwork on multiple levels – through the land and the emotional connection between women as they share stories and participate in ceremonies. 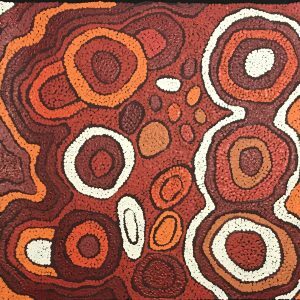 Debra’s works have begun to be exhibited more in the recent past with her works being recognised and admired by local Alice Springs galleries and around Australia. 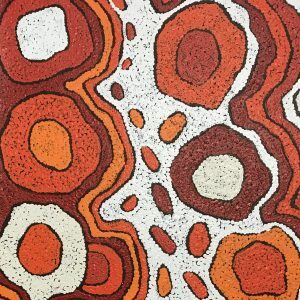 She is an emerging artist and the stories that are shared through her artwork are important and sacred for Pintupi people and as such should be included in any collection. 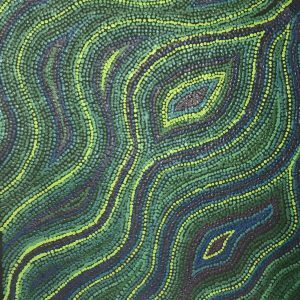 SKU: DYOU201507 Category: Aboriginal Art Tags: Pintupi Art, Central Australian Aboriginal Art.